More than 20 employees were thanked for 25-years of service. Front row (l-r) Teresa Wrzesniewski, Sharon McCoubrey, Karen Whitehouse, Blythe Nilson, and Wendy Mohns. Back row (l-r) Barbara Rutherford, Qiduan Yang, Piotr Wrzesniewski, Murray Newman, Catherine King, Andrew Irvine, Karen Hill, Jack Boychuk, and Tena McKenzie. Missing from photo: Wendy Andrews, Fes de Scally, Mary Forrest, James Hull, Jim Johnson, Janet MacArthur, and James Rochlin. UBC makes a point of celebrating the milestones of its students. The same goes for employees—and administrators at the Okanagan campus recently honoured 28 people for their years of dedicated service. More than 20 of those employees were applauded for 25 years of service, while James Tanner was congratulated for 30 years; Joyce Boon, Doris Callaghan, and Carolyn MacHardy were thanked for 35 years; and Edward Butz, Barrie McCullough, and David Smith were congratulated for more than 40 years. UBC Okanagan was established in September 2005 and Levell said while some long-time employees have worked at both the Vancouver and Okanagan campuses, many employees started their careers at Okanagan College and simply continued working when UBC opened its doors. “Whether you began with Okanagan College or with UBC in Vancouver, you have been part of building a remarkable college and university system for this province. And one that serves the Okanagan in extraordinary ways,” Levell added. Also on hand to celebrate the many years of service were Deborah Buszard, deputy vice-chancellor and principal of UBC Okanagan, Cynthia Mathieson, provost and vice-principal at the Okanagan campus, and special guest Jim Hamilton, president of Okanagan College. Each employee was presented with a gift to thank them for their decades of service. 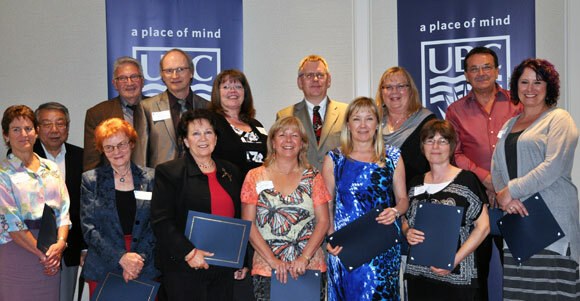 By far, this is the largest group of employees UBC Okanagan has celebrated. 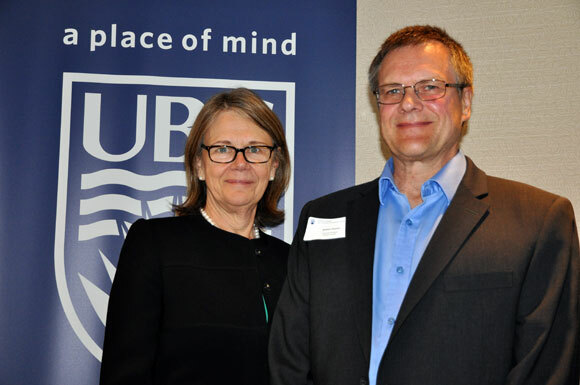 Deborah Buszard, Deputy Vice-Chancellor and Principal of UBC Okanagan’s campus congratulates James Tanner for 30 years of service. 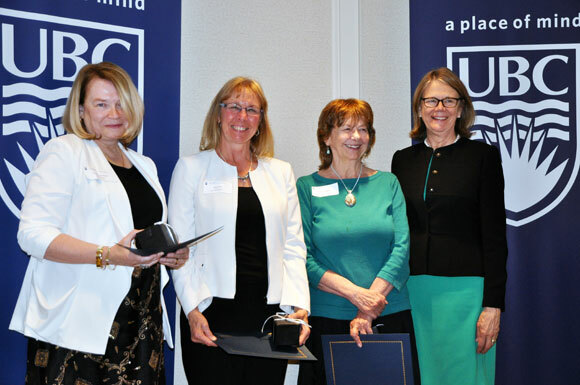 Carolyn MacHardy, Joyce Boon, and Doris Callaghan, are congratulated by Deborah Buszard, Deputy Vice-Chancellor and Principal of UBC Okanagan, for 35 years of service. 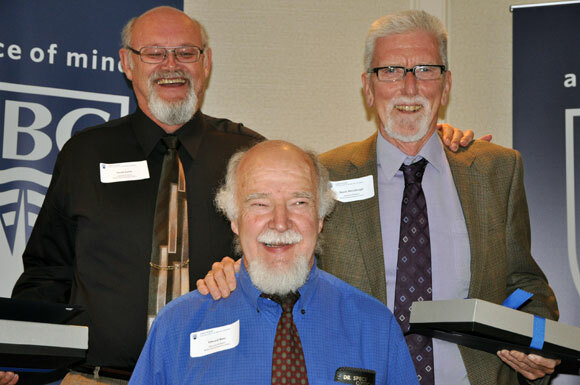 Edward Butz, David Smith and Barrie McCullough, all with the Irving K. Barber School of Arts and Sciences were congratulated for more than 40 years of service.